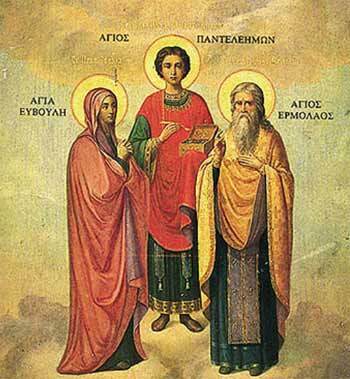 Note: the transliteration of names in the story of this saint is quite variable. In the following, the style commonly used in the West is presented when available. St. Pantaleon was a contemporary of the brothers Cosmas and Damien who are perhaps the best known of the physician saints (along with St. Luke the evangelist; Pantaleon has a particularly important place in the Orthodox Churches, comparable to Cosmas and Damien). The following story incorporates later additions that embellish the original knowledge of his life that had been passed on during the fourth century. Pantaleon was born about 284 A.D. in the city of Nicodemia (currently called Izmit, in northern Turkey near the Black Sea). His mother, Eubula, was a devout Christian who raised her son in the Christian way of life, while his father did not convert until much later. She passed away while her son was still young. Pantaleon was handsome, soft spoken, and humble; all who spoke with him felt true happiness and peace. His father, Eustorgius, sent him to study under a famous physician, Euphrosinos. One day Pantaleon went with Euphrosinos to the palace where the ruler, Maximian Herculius (who reigned 286-305 A.D.), first encountered him. Maximian instructed Euphrosinos to educate Pantaleon to the extent that he could be appointed royal physician. Pantaleon was also watched over by St. Hermolaus, the head of the Church in Nicodemia. Hermolaus asked him about his religion. Pantoleon told him that while his mother was alive he had been a Christian, but after her death his father had made him follow the pagans. Hermolaus told him that if he believed with all his heart in the true God he would be able to cure anyone with His help. After that, he went to Hermolaus for counsel and began to accept Christ with all his heart. One day, Pantaleon saved a child from certain death after being bitten by a viper, a miraculous recovery. He needed no further proof that Christ was the true God. Hermolaus baptized Pantaleon, gave him Holy Communion, and instructed him in the Sacraments of the Holy Church. Pantaleon then remained for seven days with Hermolaus to become acquainted with the teachings and practices of the Church. Another miraculous healing occurred; Pantoleon cured a man of his blindness; he regained not only his sight, but also his spiritual vision. Pantaleon's father, upon learning of this, converted. Pantaleon took the man who could now see and his father to St Hermolaus, who baptized them. After his father died, Pantaleon freed the estate's slaves and distributed his wealth among the poor and then proceeded to cure all who came to him. The only payment he would ask was that the healed persons believe that Jesus Christ was their true healer. The other physicians became envious; wanting to betray him to the Emperor, a group of them went to Maximian and told him that Panteleon was healing people who were converting to Christianity. As proof, the blind man who was cured was brought before the Emperor, who tried to convince the man that the gods had cured him and not Christ. But it was futile; he ordered that the man be beheaded. Pantaleon was ordered to appear before the Emperor, who described the charges against him and tried to save Pantaleon by having him make a sacrifice to the Roman gods. He refused. Those opposing Pantaleon asked the Emperor to execute him so that Christianity would not gain in popularity. This occurred during the Diocletian persecution (the Emperor Diocletian ruled the Eastern provinces, while Maximian ruled the Western provinces of the Roman Empire). Failing to convince Pantaleon to betray his Christian beliefs, Maximian ordered him tortured and killed. However, he miraculously survived several attempts. Eventually, the Emperor had Pantaleon, Hermolaus, and two other men (Hermippus and Hermocrates, who were brothers) who also refused to renounce their faith, beheaded. The body of Pantaleon was anointed with myrrh and buried outside of the city. His remains, or a portion of them, were later moved to Constantinople. He was named Panteleimon, meaning the all-compassionate. In the Middle Ages, he came to be regarded as the patron saint of physicians and midwives. 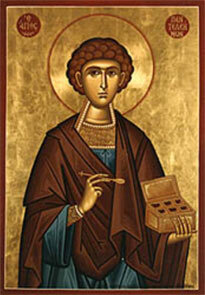 Numerous churches, shrines, and monasteries have been named for St. Panteleimon. Like Cosmas and Damien, he is remembered for his generosity in providing free medical care, and for his unwavering faith unto death. "You emulated God's mercy, and He granted you the power of healing, o Panteleimon, victorious martyr of Christ. Heal our spiritual diseases through your intercession, and as we constantly cry out to the Lord, 'Save us!' take away the temptations which the enemy always places before our steps." "Grant, we beseech thee, Almighty God: that by the prayers of thy holy Martyr blessed Pantaleon, we may be delivered from all adversities which may happen to the body, and from all evil thoughts which may assault and hurt the soul." 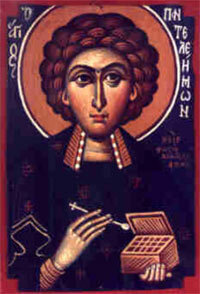 Icons of St. Panteleimon showing him holding a medicine box.